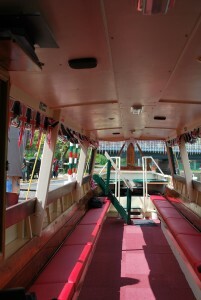 Jubilee is a traditional narrowboat purpose built for carrying passengers. It has seating for up to 29 passengers and the sides can be opened up to the fresh air in fine weather, but with protection for colder days. Jubilee is crewed by volunteers of the Kennet and Avon Canal Trust. A licensed bar, refreshments and a toilet are available on board. Please note – we have no card payment facilities on board. Cash only. Customers are welcome to bring a picnic or other catering but please note that serving space is very limited. There is a fully licensed bar on board with wine, beer, cider and lager available. You may bring your own alcoholic drinks only with our prior agreement. A corkage charge would be payable. Northcroft 1¼hrs Leave Newbury Wharf, travelling through town and under historic Newbury bridge. Onto Newbury Lock and swingbridge and then out into the countryside as far as Northcroft and then return. A figure of 8 +/- 2¼hrs This charter uses a figure of 8 journey – From the Wharf we will travel through Newbury lock and swingbridge and out through the countryside to Northcroft where we will turn. We will then travel back past the wharf, through Greenham lock to turn above Ham lock and return to the Wharf. This is a varied trip with lots of interest which can be tailored to your requirements. Benham Wide 3½hrs 3.5 hour trip leaving Wharf, going west to BenhamWide/Marsh Benham passing through the beautiful Berkshire countryside and rising up 4 locks before our return. This is just a selection of trips available. We may be able to tailor trips to your requirements. If you have something special or another trip in mind please contact our office. Please note: Jubilee does not have the facilities to load passengers in wheelchairs. All passengers must be able to enter and leave the cabin using the steps at the entrance. The crew will be on hand to offer assistance. Timings are approximate and may vary dependent on canal traffic. We recommend that you allow for possible late return when paying for parking. All trips must be completed by sunset. Jubilee operates from Newbury Wharf, close to the Stone Building café and Information Centre (RG14 5AS ). Public car parking is available on the wharf.